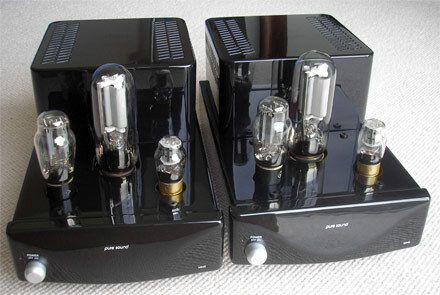 The M845 mono power amplifier is a single ended design based around the 845 power triode. Operating in Class A and giving 27 Watts of output power, it will complement a wide range of medium to high efficiency loudspeakers. The 845 triode was originally developed by RCA in 1931 as a radio transmitting and audio amplification valve. The anode is machined from solid graphite to allow high power dissipation. It has an extremely linear transfer characteristic. In recent years, a renewed interest in this kind of valve has resulted in them being manufactured again by various factories in China. Implementing the 845 in a sympathetic circuit which takes full advantage of its capabilities is not straightforward. The filament draws a significant amount of power and also forms a part of the signal path so energising it correctly is a critical part of the design. The valve also operates with very high voltages across it so again, a careful choice of filtering components for that high voltage supply is essential such that adequate current is available to the valve at all audio frequencies instantaneously. In the M845 this supply includes a hybrid Graetz bridge for the initial rectification and a substantial smoothing choke as part of its CLC type filter. Although all of the elements; power supply, circuit topology & component choice have a profound effect on the overall performance of a valve amplifier, one of the most important aspects is the design & construction of the output transformer. A high primary impedance, the resultant large step down ratio and the need to maintain a high level of insulation between the windings all conspire against the transformer designer and the quest for extended bandwidth with efficient power transmission. The M845 utilises an in house designed output transformer that underwent extensive trials using a variety of core materials and winding techniques before the final configuration was chosen The other difficulty in using the 845 is in the design of a stage capable of cleanly delivering the voltage swing necessary at its grid to take it to full output. The M845 incorporates a driver stage based on the 6SN7 triode coupled via a custom wound, wideband, interstage transformer. The amplifier’s input stage is directly coupled to this driver meaning that there are no coupling capacitors used in the circuit at all. The circuit also operates without any negative feedback. The end result is an amplifier capable of reproducing the full measure of instrument tone with extraordinary dynamic contrast, energy and colour. When partnered with appropriate loudspeakers the M845 will deliver an unparalleled reproduction of all types of music.